Didgeridoo Fundamentals is a FREE online course that will give you the skills necessary to sound great on the didge and to understand what it take to master circular breathing. Much of what we cover in this class are strength building exercises and best of all, you do not need a didgeridoo to take this course! If you have one, even better. Through a combination of audio, video and worksheets you will be guided through a number of approaches to enhance your didgeridoo playing. 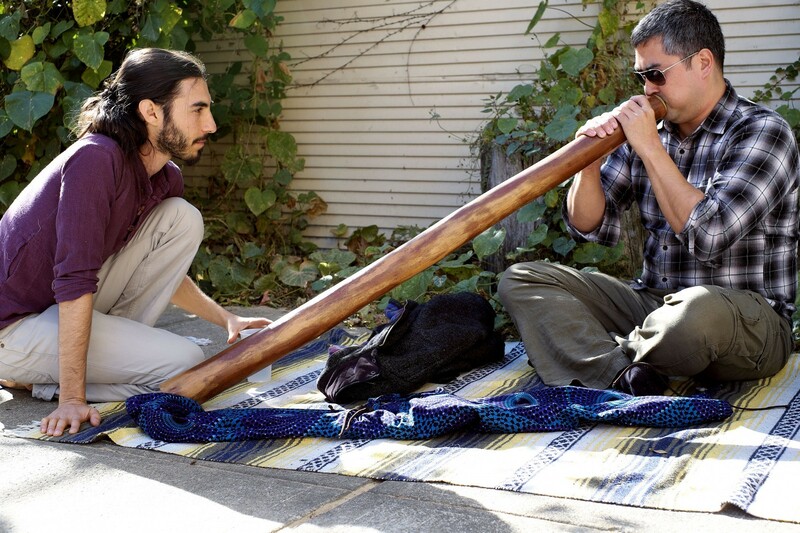 This course, led by Didge Project’s AJ Block and Jerry Walsh, will benefit all levels of didgeridoo players, starting off new players with good habits and helping experienced players get a better sound and learn ways to practice circular breathing. AJ and Jerry have combined the knowledge gained from working with many didgeridoo players and put together this program to help beginning and intermediate didgeridoo players progress faster. *Keys to breathing with strong air support. *How to expand your lung capacity. *How to identify a good didgeridoo sound. *How to begin training for circular breathing. *How to stay relaxed while playing. *How to develop a resilient respiratory system for the treatment of snoring, sleep apnea and asthma. *The #1 secret to playing rhythmically on didgeridoo. 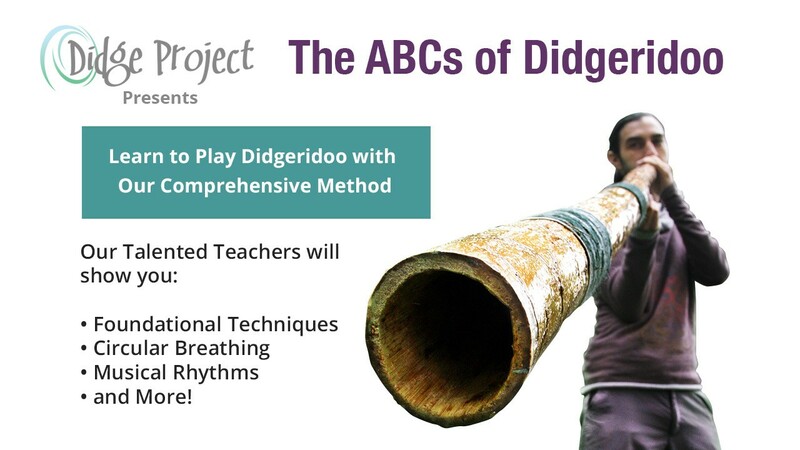 Want to skip the free class and dive straight into our ABCs of Didgeridoo Package? In The ABCs of Didgeridoo you will get the support you need to improve your didgeridoo playing. Didge Project has now worked with nearly a thousand people, helping them achieve their goals with the didgeridoo. Our team consists of individuals that both perform on the didgeridoo and teach how to play it, and I am excited to offer you the chance to work with us in a one-on-one setting. Utilizing our step-by-step method, you will learn all the foundational techniques required for didgeridoo playing and how to put them together into a complete sound. Imagine yourself playing longer and stronger with greater musicality. Whether you’ve barely touched your didge yet or are already droning and jamming, we will show you exactly what you need to do to take your playing to the next level. Most importantly, receiving feedback from a trained teacher is the key to continual progress. We’ve seen a lot of people try to learn didgeridoo from video lessons but without the direct accountability provided by a teacher, the learning process is a lot slower and more challenging. A teacher can see you where you are at and help push you forward to a higher level. Best of all, you can take advantage of this offer from anywhere in the world! Our private instructors are available to meet on Skype, Google Hangouts, and Facetime. If you are in New York City, this offer is available in-person at our space in Greenpoint, Brooklyn. For meeting at other locations, please contact us directly. My path to playing the didgeridoo began with difficulty staying asleep at night and low daytime energy. An overnight sleep study showed that I had sleep apnea. As recommended, I purchased a CPAP machine and oral appliance but found them too uncomfortable to utilize. 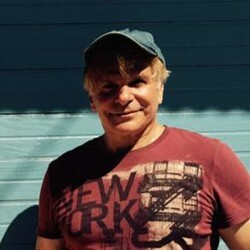 I asked the doctor, “Are there any throat exercises I might try?” to which he replied, “the only exercise we know about that has shown to help sleep apnea is playing the didgeridoo.” The doctor gave me the contact information for Didge Project in New York City where I met and began to study didgeridoo with AJ Block doing private lessons and his group program. The ABCs of Didgeridoo is available by application only. We select candidates who demonstrate a willingness to commit to the entire course of study. Are you ready to commit to one-on-one didgeridoo lessons with a private instructor? If so, please fill out our application to be considered for The ABCs of Didgeridoo.